Come and make family memories at The C.C. Ranch. 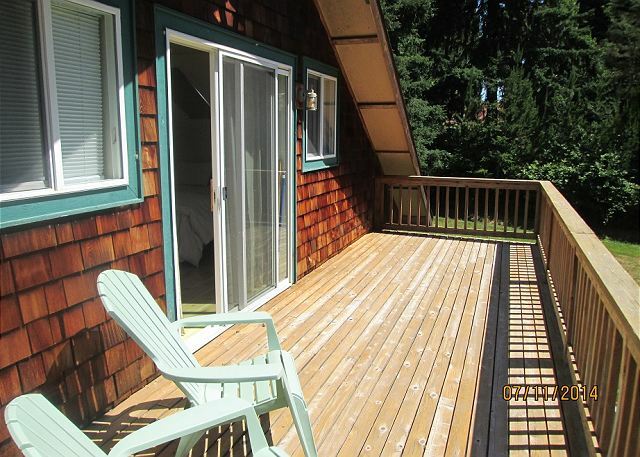 Enjoy this 3 bedroom, 2 and a half bath, 1,800 square foot cabin with family and friends. 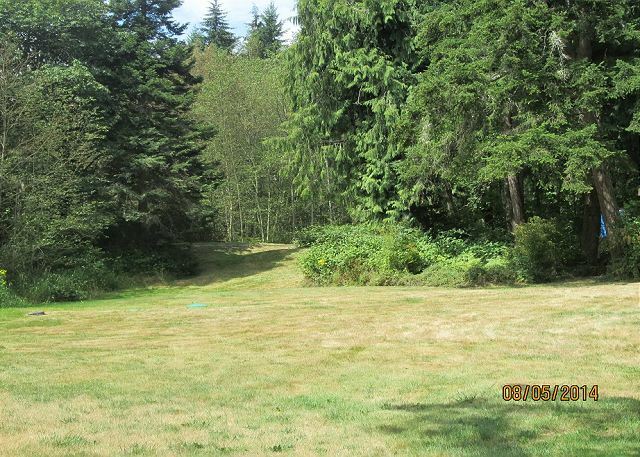 The fully-fenced and gated 1.25 acres is ideal for dogs. The grassy areas of the yard are great for pick-up soccer games, badminton, croquet, whiffle ball, Frisbee or any outdoor activity. The property features a small pond which is home to tadpoles, frogs, and ducks. The covered front deck is ideal for sitting and relaxing and allows you to cook on the charcoal grill in any weather. The back deck has a picnic table for outdoor eating and is shaded in the afternoon by mature hemlocks. The second floor deck off of the master bedroom is perfect for star gazing. The second floor master bedroom has a queen bed and its own full bath with two sinks. The two other upstairs bedrooms share the second full bath. The main floor is an open concept. The kitchen and dining area are separated by a bar height counter. The kitchen is fully stocked with dishes, glasses, silverware, cooking utensils and features a microwave, gas range, toaster, and dishwasher. The living room offers extra space and a quiet area. The family room has comfortable couches, television, cable and a closet full of board games and toys. A gas stove adds coziness and warmth on cooler evenings. Wifi (n-wireless) makes using a laptop or tablet from anywhere in the house convenient. There is a half bath off of the family room where the washer and dryer are located. C.C Ranch is minutes from the center of Freeland and convenient to grocery shopping at both Payless and the Goose in Bayview. Holmes Harbor/Freeland Park is ½ mile walking distance where you can beachcomb and enjoy a playground with a view of the harbor. Greenbank is 10 minutes away. Ebey’s landing is 25 minutes. Double Bluff, Whidbey’s best dog friendly beach, is 5 minutes away. In 10 minutes you can visit Goss Lake which is great for swimming. CC Ranch has all the conveniences of your own home while escaping to a private getaway in the country. Enjoy! Make memories that you will treasure forever! THIS HOME HAS A 4 NIGHT MINIMUM IN JULY AND AUGUST. 2 DOG MAXIMUM. A great place for a family gathering. My dogs loved the huge yard. The house is roomy and we did not feel cramped with 6 people, everyone had their own space plus plenty of bathrooms. Thank you for your comments. 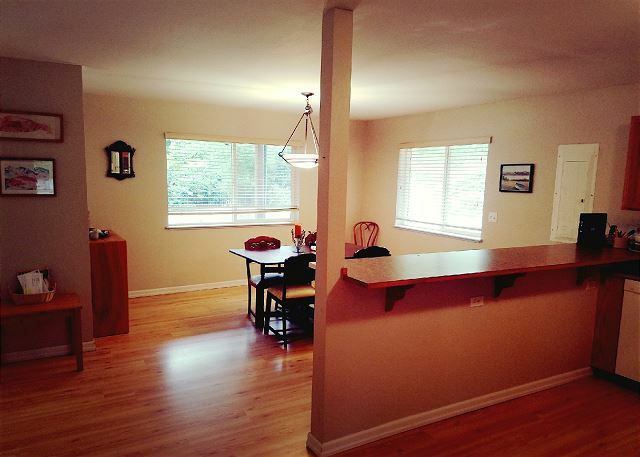 We are so happy you had a "great place for a family gathering" on Whidbey Island. We hope we can help you with your next stay on the Island. My family and I had a great week at the CC Ranch. Perfect for the 5 of us. Really enjoyed the house and found it's location well suited to our needs. Thank you for your comments. We are happy you and your family had such an enjoyable stay here on Whidbey Island. We hope we can help you with your next stay on the Island. We're so glad you had a great experience! Come back soon! We're so glad you had a great time! Thanks for your review! So glad that this property worked so well for your needs! We hope you'll come back soon. Thank you for your review! Goods: House/Cabin is semi secluded with easy access to food restaurants. The cabin was clean upon arrival and everything we required was there (paper towels, dish soap etc.). We enjoyed sitting on the deck with a glass of wine. Marisa at Tara Rental Properties was very helpful and was easily accessible to help us with basic needs. Thank you! Others/not deal breakers: semi out dated, floor is coming up in the downstairs bath, we reported it because we weren't sure the owners knew or not. But I'm finding myself thinking about others... so... I'd stay again! We're so glad that you liked the location of the house and that your needs were met upon arrival. The house is scheduled to have the flooring fixed in the next few days, so thank you for notifying us of the issue! We hope you'll come stay again. Thanks for your review! Overall this was a great vacation rental and a wonderful property, especially for the dogs. Only suggestions I would have are get a bigger bed for the master (too small for 2), consider upgrading cookware and make sure hand soap and dishwasher soap are available to guests. Thank you for your review. Glad you had a great vacation on Whidbey Island. Our family stayed at the C.C. Ranch this summer and we had a great time. The house was perfect for small children. It was child proof and clean. There was plenty of space to run around outside and there were lots of blackberries to pick. We had a terrific time and plan to return! So glad to hear your family had a great visit to Whidbey Island. Thanks for your review. 1st the bad.Not cleaned well, dust bunnies and spider webs in corners, on light fixtures and windows.Which makes you question the cleanliness of the bathrooms,kitchen and linens.Neighbor's dog wakes you each morning at old and emits a high frequency noise that made it impossible to have on. Light fixture in master bath painted on so unable to replace burned out bulb=dim bathroom.But the worst was the shower heads that will send you to your chiropractor. Could be fixed with a shower head on a hose so you could mount it higher!! The Good. Quiet location (except dog)surrounded by blackberries and trees with quail coming out each evening! Decently stocked kitchen (except very dull knives)with nice bar and dining area.Plenty of bathrooms so no one is waiting. The upstairs does get warm with the skylights, but opening windows and using fans cools things off in the evening. There was no key left inside but one call and a new key was quickly delivered. No view of the water, but wasn't expecting one. Nice views of the trees and yard. Thank you so much for your review. Cleanliness is very important to us and we will be addressing this issue right away. Please don't hesitate to ever call our office if there is anything we can do to make your stay more comfortable and pleasant. I wish we would have discovered The C.C. Ranch sooner! The C.C. Ranch is the perfect dog-cation location. Fully fenced acreage kept our minds at ease with our furry family members. Great accommodations, very responsive property managers. Great customer service. Close to the great grocery store, Payless Foods. This is definitely a place I would schedule regular returns. We are so glad that you enjoyed your stay! Thank you so much for your review. This was a very nice cabin/house with large spacious yard. Very close to the sound, groceries, and other conveniences. We were looking for a shorter drive/quick short vacation with our dogs. And this place definitely fits the bill. The dogs love this place, the yard is absolutely perfect for a good soccer game with your dog. Double Bluff beach is a great place to take your dog, although extremely popular so it gets crowded. There were a couple of things that bothered us: the master bathroom's shower head is really low, makes taking a shower a bit uncomfortable. I understand the roof line makes it difficult. The second thing is the neighbor's dog barked continually, the dogrun is immediately on the other side of the fence, so it was very loud. Our dogs were bothered by the constant barking, as were the humans. Thank goodness the dog was brought inside over night. Had fun, great place to bring your pets. We really enjoyed our stay! The house is nice and open, the yard is fenced and private, it's quiet and calm and a perfect vacation spot. The dogs loved running in the big yard and the property is close to restaurants, dog beach, farmers market, etc. We will want to come back! Five of us stayed here for a writing retreat, and it was just lovely. Sunny, quiet, and roomy enough to spread out and to each have our own bed. The beach is a short walk away. Highly recommend. Family and kids stayed here for four nights and really enjoyed it. Though a five minute drive to grocery store and restaurants, it was quiet with a big yard for kids to run around. House is clean, beds are comfortable and kitchen is well-equipped for cooking. Outside gas grill was handy (though we ran out of gas on second use). Plenty of games and puzzles for kids, along with a DVD player. Double Bluff Beach is a 7 minute drive away and perhaps the best beach on the island for swimming, walking, beautiful views, etc. We had a very nice time in this house. It has two nice bedrooms, and there were two pull-out couches downstairs, so plenty of room. It was newer than I expected, and also had a nice kitchen and bbq outside. The only thing weird was the dishwasher, which seemed to have a mind of its own, and run at all hours:) The house is located in Freeland, which is not the cutest village on the Island, but was still convenient, and it had an excellent grocery store nearby. The rental agency was very nice to deal with. I would stay here again!